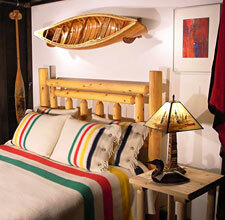 Wood, the only major artistic medium that begins as a living thing, is one of the most versatile materials on earth. It can be bent, carved, turned on a lathe or used as an armature. It can remain in its bark or be oiled, finished or painted. It can be used to make spoons, weapons, violins, yachts and habitable structures. It can be burned. The ubiquity of wood makes it nearly invisible. But not in our back yard. From the heart of downtown to American Traders on Route 9 to Omondi Woodworking on Cotton Mill Hill, Brattleboro is beautifully laced with boats, furniture, sculptures and other pieces that not only use wood but also reveal and revere the interior character of the medium. While this article cannot highlight every local woodworker, we hope to present a cross-section of the variety of work that graces our shops and galleries. With rustic cedar furniture, sleek toboggans and other wooden delights for people who love to be outdoors, American Traders is a unique phenomenon, densely packed with lovely handmade things. 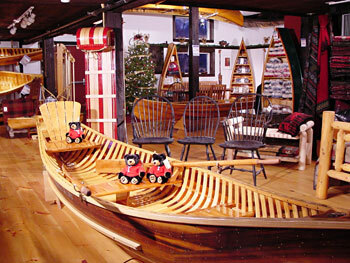 But the wooden canoes and guideboats are the main feature. Because boats are vehicles with highly specialized uses for different activities in different kinds of water, their form must follow their function to an extreme degree, lest the occupants end up wet (or worse). Most pieces at American Traders are inspired by Native American traditions. At the other end of town, at Omondi Woodworking in the Cotton Mill complex, we find a different extreme of culture and style. 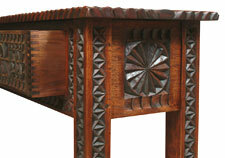 Daniel Omondi Odhuno began making fine furniture at the age of 13 in his father's workshop in Mombasa, Kenya. While Omondi does make some pieces in contemporary American style, his signature technique -- elaborate geometric carvings -- comes straight from Kenya. "I thought I could work for other people and do it their way," says Omondi. "But I started to get my own ideas about how I wanted things to look." After a few years in the U.S., Omondi felt compelled to return to his own craft, applying his Bajun carving style to expertly designed works comprised of both African and North American woods. Among his most intriguing pieces are demilune tables combining ancient, contemporary, and traditional elements: a rough pedestal with a plank of smoothly polished wood atop a carved carriage. While Omondi has received a spurt of recent attention for his unique work, winning "Best in Show" at the Providence Fine Furnishings Show, the award has not affected his humility or his resolve. "You make your art, people buy it, and you keep making your art. You make your art, people don't buy it -- and you keep making your art," he quipped. "It's like an addiction." Tucked into another downtown corner we find Rueter Woodworking and Gallery, a relative newcomer to the Brattleboro woodworking scene. Proprietor Bob Rueter shows his own work in this space, which also houses his studio, along with sewing boxes, cutting boards and other small pieces by fellow cabinetmakers Jason Breen, Philip Odegard and Peter Vogel. Rueter also maintains a gallery to add color and other visual interest; this month he continues to feature candid photographic portraits taken in Guatemala by Pablo Pitcher. Rueter revels in the contrast of straight structural lines with eye-pleasing curves. Originally envisioned as an exemplar of golden rectangle proportions, his coffee table ended up with elegantly curved legs. "There are no golden rectangle proportions in that table," he said with a smile. Like many woodworkers, Rueter enjoys the combination of engineering and art that cabinetmaking requires; he particularly enjoys leaving the final plans open until after he has started working with the wood. "I really like the design process," he said. "It is so exciting to me." 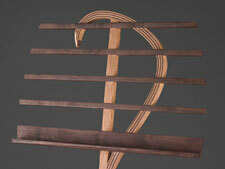 Rueter is also a singer, and one of his signature pieces is an oak-and-walnut music stand -- available either fixed at a customized height or adjustable. The ingenious design looks like a bass clef on a staff, supported by a graceful oak tripod reminiscent of tree roots or a dancer's legs. Rueter is currently working on a treble-clef version. 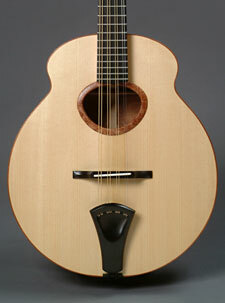 Music and woodworkers seem to go together, and they are combined directly in the art of luthiery. "There are functional considerations with anything you build in wood," says Scott Hausmann. "With instruments, you're always thinking about the tone." As his "day job," Hausmann makes instruments at Froggy Bottom Guitars in Newfane. At off hours, he builds fine furniture, some of which he shows at Gallery in the Woods. 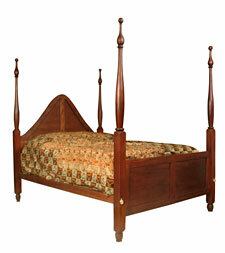 Like many cabinetmakers, he has little interest in making the same piece twice. "I really consider myself a maker and an artist," Hausmann said. "My interest in my work presently is less with the economics than the good of the art." Hausmann's stunning sculptural pieces are the kind of thing you might expect to see in a museum rather than a home -- which makes it all the more surprising when they turn out to have hidden practical features. A wall-mounted table with a fluted pedestal could physically and aesthetically support a bust of Pallas, but it also has drawers (see top left). "I enjoy incorporating moving parts," said Hausmann. "I love to watch the act of discovery. One of the things I'm trying to do is show people something they haven't seen before." 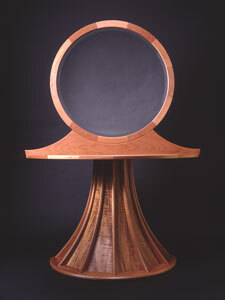 Of a round lacewood and ebony pedestal table currently on display in the window at Gallery in the Woods, he said, "I chose that piece of wood because it was so outrageous: I knew it would be dramatic." The piece succeeds, from his point of view, because it "gets people's creativity juiced up. Stimulating people's imaginations is very gratifying." While Hausmann will continue to make furniture and instruments, he hopes the next phase of his art will be to "take function out of it" altogether and make sculptures. Gallery in the Woods features fine tables and cabinets by several woodworkers, including gallery co-owner Dante Corsano. Like many cabinetmakers, Corsano started out doing projects around the house. He also worked as a finish carpenter around other people's houses, a job that culminated in major renovations of Victorian mansions in Buffalo, N.Y. Eventually, when he and his family moved to Vermont, he decided to "put [his] shingle out as a furniture maker" because he wanted to work at home with his children. "It's not like I went to school for this," said Corsano. "I fell into it because we had a bunch of kids and had to figure out how to make money." While the demands of parenting have faded, the demands of the gallery have increased, and Corsano has less time for commissions. 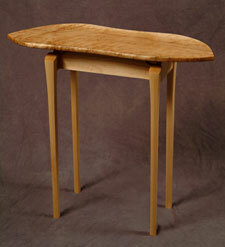 The quiet focus of woodworking, though, "is a nice counterpoint to the gallery." Corsano's work tends to feature defects and aberrations, but shows an equal and contrasting fascination with symmetry. One large, reversible cabinet on display at Gallery in the Woods has book-matched walnut panels and continuous lines down the sides. "It's a little more effort to keep track," Corsano said. "But when you look at it and the lines connect, it feels harmonious." 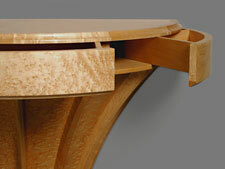 Corsano sometimes uses wood that other cabinetmakers would toss into the scrap heap. Matches and connecting lines draw random knots and figures into their harmony, creating a kind of beauty that perfect pieces never attain. "I have an irreverent relationship to wood," said Corsano. "To everything, really." "Irreverence" is probably not the word that will come to mind as you marvel at the smooth, polished surfaces of the finely joined works of art at American Traders, Omondi Woodworking, Rueter Woodworking and Gallery in the Woods. Unless you think, in defiance of received wisdom, that their beauty rivals the loveliness of the trees themselves.